The new Leica Disto X4 has a more rugged design for tough conditions. Pointfinder Camera: for long distance measurements in bright sunlight. Bluetooth Smart: Create sketches, plans and document your measurements on your smartphone or tablet automatically when taking measurements. Supports iOS, Android, and Windows. Easy detection of stake-out position due to dynamic marks on the display. Visual information indicates exactly where you are. 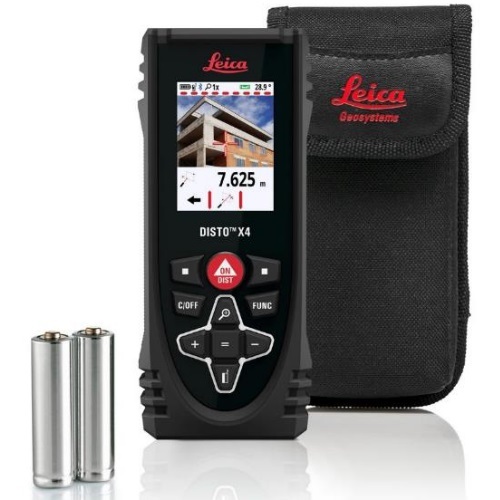 The range and accuracy of all Leica DISTO devices are checked in accordance with ISO 16331-1. As a result, you can be sure that the performance of the instrument is maintained not only in the test lab, but even more importantly on everyday site takes.